And if you're tracking fixed assets manually or in spreadsheets, you already know that manual adjustments and data entry can be time-consuming and cause costly errors. 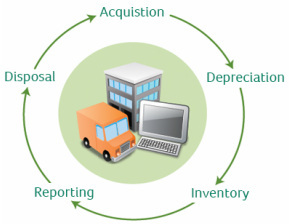 Sage Fixed Assets automates your entire fixed asset process from acquisition to disposal. Not only does it save time and improve accuracy, Sage Fixed Assets can help you recover from a disaster, stay compliant with federal regulations, and prevent you from overpaying on taxes and insurance. Depreciation: Enjoy simplified fixed asset tracking with comprehensive depreciation calculations including over 300,000 U.S. and Canadian regulations for businesses, governments, and nonprofits. Tracking: Conduct thorough physical inventories of your fixed assets with an easy graphical step-by-step process and state-of-the-art mobile devices. Planning: Take control of your fixed assets before they even become fixed assets with flexible management of capital budgeting and construction-in progress projects. Reporting: Create an endless variety of custom reports, including charts, graphs, and advanced formatting options. Services: Get up and running quickly with customized inventory and professional services as well as expert, hands-on training. Watch this short video to learn what Sage Fixed Assets can do for you and your business.